Looking flawless after a long flight? It’s possible! I may not (yet) be able to do my own taxes but if there’s one thing I’ve mastered, it’s my skincare and makeup routine for long-haul flights. Long-haul flights are the killer of beautiful, hydrated skin due to the extremely dry airplane air. Now, it sounds impossible to look good after flying for 6-12 hours, but you can definitely achieve that flawless celebrity-just-off-the-plane look if you follow a few rules. Here are some tips I’ve learned from being a frequent long-haul flier (14+ long, long flights…). I always make sure to shower before my flight and pile on the body lotion. Skip over hair products so you have clean, un-touched hair that won’t break you out. Face-wise, it’s important to follow your normal skincare routine no matter what time of day you leave for the airport. Make sure to fill up tiny, travel-sized bottles of your cream and toner. I highly recommend not wearing any makeup to the airport. 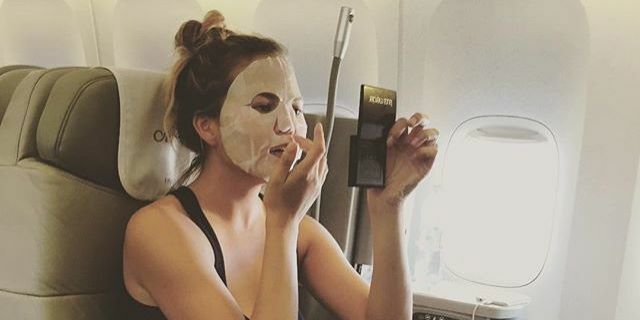 Some people put on their makeup and then take it off on the airplane, but I prefer the lazy route – why even deal with that extra step when you can be makeup-free from the beginning? Clean hands are an absolute must for applying your skincare products. So after getting settled on the plane, the first thing I use is hand sanitizer. I follow that up with facial wipes, using one for my hands and another for my face. Facial wipes are a lazy girl’s best friend for long-haul flights since your window seat and long lines may keep you from going to the bathroom. For that deeper cleaning and moisture, follow up with a few swipes of toner with a cotton pad. Toner helps to take off any chemical irritants like fragrance left over from the face wipes. As someone with sensitive skin, I always make sure to do this to prevent red blotchiness! If I don’t thoroughly cleanse my skin, I usually end up with a pimple after a long-haul flight so make sure your face is cleansed properly if you don’t want any surprises on your face. The airplane air really dries out your skin, which can cause flaking, pimples, and overactive oil production, so make sure to really pile on your face cream. I prefer using a cream rather than a moisturizer during a long-haul flight since it’s thicker and more hydrating. Your lips aren’t safe from the dry air either so make sure to use lip balm. I personally find lip balm sticks more hygienic than regular lip balms since my fingers may not always be clean to apply balm. I always make sure to finish off my skincare routine by putting on hand cream. Since you’ll be taking products on and off during the flight, it’s important that your hands are moisturized as well as clean. At the halfway-point of your flight, there’s a good chance that your skin is in need of a moisture re-fill. Now, I’m one of those people who isn’t ashamed to whip out a face sheet mask and sleep with it on, but for those who aren’t so into that, I recommend using overnight face masks. Most overnight face masks apply clear so they’re great for pampering your face without the stares. They also don’t need to be washed off like a clay mask, so that’s one less trip to the cramped bathroom. Face masks have honestly changed my long-haul flight beauty game so even if it may be a little awkward using face masks on a plane, it is totally worth the moisturizing benefits. If you need even more moisture, feel free to spray your face with a facial mist. Don’t have one at hand? Your toner in a travel-sized spray bottle works just as well. “What?” you may be saying, “You just said don’t wear makeup on the plane!” Yes, that’s true, but I like to apply my makeup in my seat forty minutes before my plane lands. I usually aim for a minimal, classic makeup look that makes me look refreshed and awake. (I’m not doing a full smoky eye or anything, though you certainly could if that’s your thing.) There’s something enviably cool about a woman who steps off the plane looking naturally fresh and polished. For a flawless plane makeup application, there are four important areas to focus on: eyebrows, eyelashes, lips, and skin. Eyebrows frame your face and highlight your eyes. For easier application, try an eyebrow powder and an angled brush as opposed to a pencil. Use your eyelash curler and mascara to wake up your eyes. I personally believe mascara is better than eyeliner at really opening your eyes. To avoid that pale vampire look, splash some color on your lips. It’s best to use a hydrating lipstick or tinted balm. If you use a multitasking product, you can also add some color to your cheeks. Conceal dark circles and unfortunate blemishes with a good, creamy concealer. A creamy formula can be easily blended with fingers so no need to whip out brushes or sponges. Though I usually go for a matte face, I skip the powder just in case the airplane air still gave me dry patches. Makeup doesn’t look good on a dry, flaking canvas so by keeping up with your skincare, you also ensure your makeup looks fresh! How do you take care of your skin on long-haul flights? What type of makeup vibe do you prefer for your post-flight look?